For my final project, I will use my research of the New Paltz Composition Book for the Collaborative History Project, along with additional research about New Paltz, surrounding areas, common fashion styles, local architecture, and the elementary school system during the 1900s, to create a realistic fictional narrative about Gertrude Dubois and her interactions with the composition book and her surrounding environment in 1904. Once I also learn about when Janie Hayden married and/or left the New Paltz area, I can also include her. Otherwise, the main characters are Gertrude Dubois, her mother Catherine Deyo Dubois, and her father Phillip D. Dubois (as he does not die until 1907). The narrative will start with the day Gertrude finds the composition notebook. Already intrigued by the dress of the time, and perhaps drawing clothing designs in other books, she pours over clothing catalogues and fashion magazines while her mother gets ready for a local gathering. As Gertrude helps her mother fit into her corset and dress, Catherine encourages her daughter to focus on her studies rather than dress, convinced by the “young society women” that women will be the scholars of tomorrow. She uses Janie (Hayden) as an example of how Gertrude should be: educated and inclined to further academic study. With this in mind, she asks her daughter to start her essay, but she needs scrap paper to plan her essay before putting it into her class workbook, so Catherine finds one of Janie’s old notebooks from the 1890s. Gertrude starts working on her assignment in the back, but when her mother leaves to attend a society gathering, Gertrude stops her work and looks at the catalogues again. This time, she uses other empty pages in the book to draw women in similarly-styled clothing. Curious about what exactly is in the book, she flips through the composition book and decides to keep it, feeling a connection to her sister since they wrote in the same book. Following scenes will describe her travels around town, and to Poughkeepsie via the local trolley, with her sister’s old composition book. 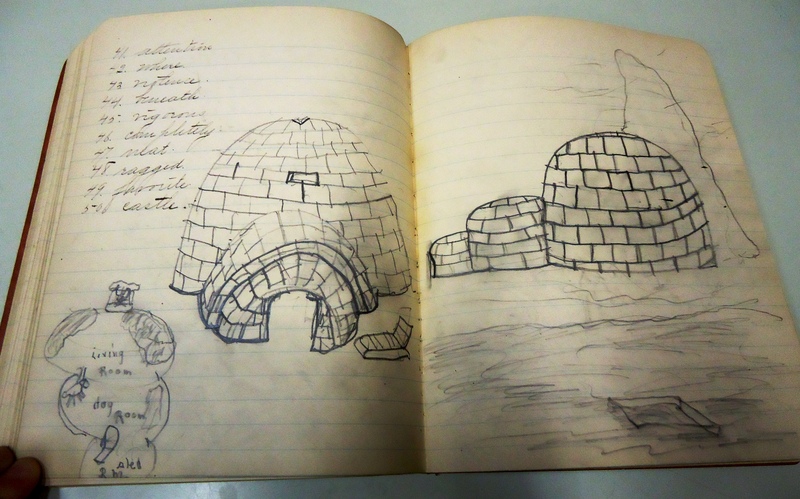 Since her architectural drawings are elaborate and detailed for a fifth grader, I expect her architectural doodles are inspired by buildings around town, her picture of an igloo relevant to a recent reading about the exotic structure, and her clothing sketches a testament to her family life and social class. Since she descends from two New Paltz founding families (Deyo and Dubois), her mother would likely be a society woman, unconsciously inviting her daughter into the social scene. From the composition book, one could see Gertrude Dubois as a creative young girl, inspired by her world around her. By meshing research about her family and surrounding environment during the early 1900s with her contributions to the composition notebook, the realistic fiction short story reveals the intriguing relationship between Gertrude and her half-sister Janie. I would showcase a sample of my work, but I write in a sporadic fashion and none of my pieces fit together in a coherent narrative. I am enthusiastic to receive feedback on the ideas presented in my summary. This book features schoolwork by two students that graduated from the New Paltz Normal School, but the contents do not feature New Paltz Normal material. Jane Hayden planned examinations across disciplines for her public school students from October 1896 to April 1897. 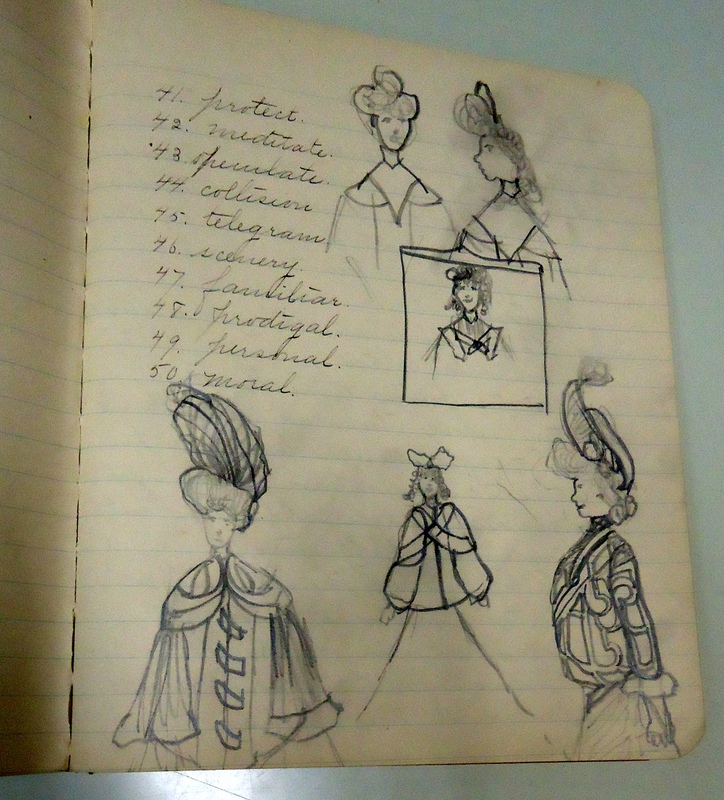 The later inheritor, Gertrude Dubois, sketched contemporary clothing designs and architectural illustrations alongside her predecessor’s examination questions. She also wrote part of a history essay in January 1904. 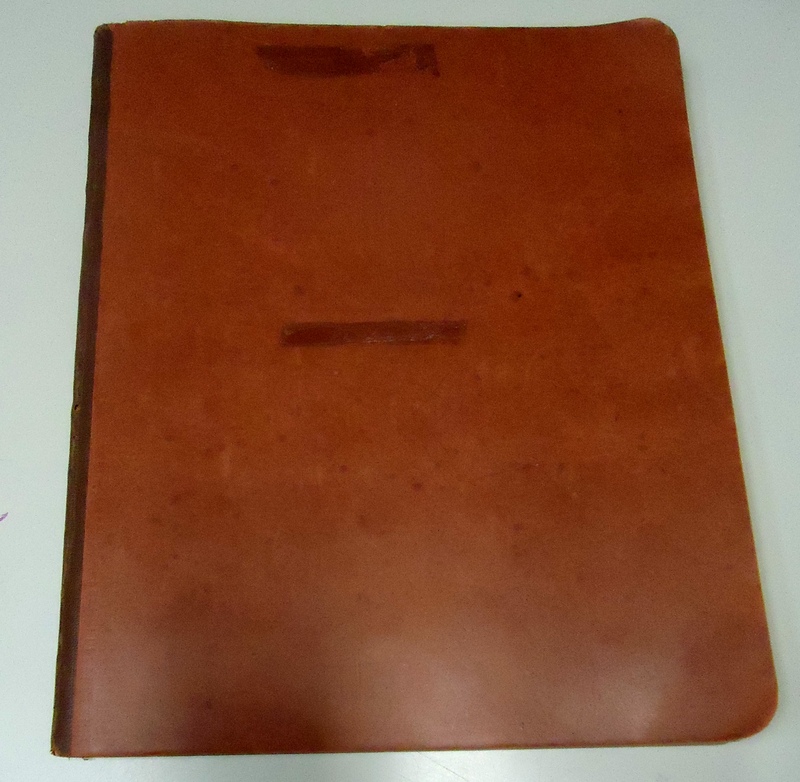 On face, the thin composition book, approximately 10×7.5 inches, hardly stands out as a historical artifact of New Paltz history. Barely threaded together within brown cardboard covers, the pages yellowed over time, yet the typical blue lines reminiscent of today’s marble notebooks are visible on each piece of paper. Inside the front cover, one clearly wrote “Jane Hayden” in pencil to indicate ownership; a scrawled script in the top right hand corner on the adjacent lined paper can be faintly decoded as “Janie Hayden,” though it looks like someone smudged the pencil marking or attempted to erase the name. Below, “Examinations Oct. 1896” heads the first page, following with “7 Arithmetic” and questions in a fine script. 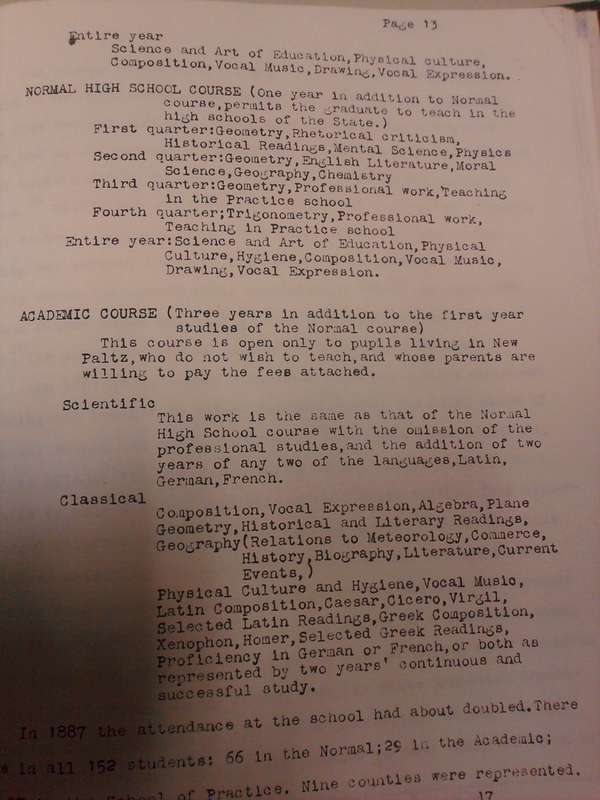 Other pages are headed by the following subjects: literature, grammar, geography, spelling, language, and physiology. Some of the questions are followed by answers, indicated by “Ans.” As the pages progress, thick pencil drawings of elaborately-dressed women and foreign architecture fill the blank spaces alongside examination questions and even some blank pages. 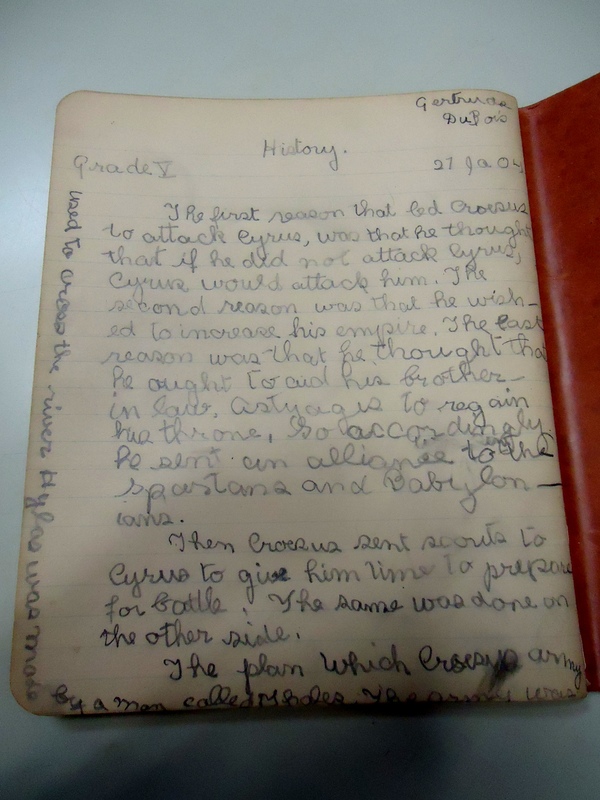 On the back, Gertrude Dubois wrote a fifth grade History essay about Cyrus and Croesus in 1904, almost a decade after the previous owner dated her last page at April 9, 1897. Obituary of Jane Hayden in Haviland-Heidgerd collection at Elting Library; reveals family connection. Two names are found within the workbook: Jane Hayden and Gertrude Dubois. Both were daughters of Catherine Emily Deyo from different marriages; John Hayden fathered Jane (July 18, 1873) and her older brother James while Phillip E. Dubois fathered Gertrude (Sept. 21, 1893). (See family tree, below) Jane graduated from the Classical program at New Paltz Normal School in 1894 and her notes from 1896 and 1897 presume educating students in seventh and eighth grades. In 1904, her half-sister Gertrude stumbles upon the book and uses it for her drawings and bits of schoolwork. Gertrude moved to Ft. Lauderdale with husband Watson Eltinge Jr. between her high school graduation (1912) and the birth of her daughter Bernice (1922). There remains no record on how the book ended up in the SUNY New Paltz Special Collection. The physical book itself has no indication of where and when it was created. The date of the text within, however, is well-marked. The first writing sample is dated Oct. 1896. A few pages later, the “Final Examinations of the Fall Term” offer the final date of the exam period: December 24th, 1896. The Winter Term kicks off on February 19, 1897. 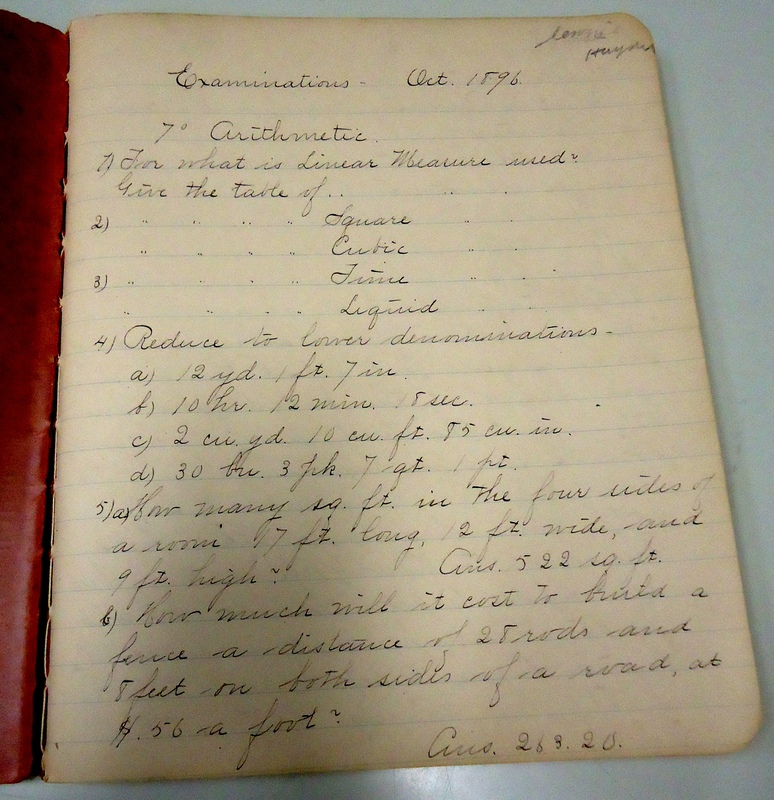 Next, the final examinations of the Winter Term are dated as April 9, 1897. Finally, Gertrude writes her short History response on January 24, 1904. First, the object is a unique historical document of the New Paltz Normal School. Between 1986 and 1917, no yearbooks exist for the institution, and while graduation lists and select school events were documented in local magazines, a very thin trace exists of the institution or surrounding academia during this time period. The exam book offers a glimpse into New Paltz academics during these undocumented years. In the same way, the composition book views the effect of the higher education institution rather than the school itself. Jane Hayden, the first author, graduated from the Classical course at New Paltz Normal in 1894 as the secretary for her class; the first date in the exam book is 1896. One could argue that the notes indicated future academic study at New Paltz Normal or elsewhere; after all, a Classical degree does not come with an education certification like the Normal course. From A History of the New Paltz Normal School. However, some of the headings do not match the subject programs offered through the Normal course (i.e. Geography and Spelling), and many of the Normal classes do not exist in the book (such as Zoology and Ethics). Also, no record exists of Jane Hayden, or Jane Minnick (her married name), graduating again from the institution, either in newspaper clippings or the Paltzanga. Plus, the small number notations alongside subjects indicate that she instructed seventh and eighth grade. However, it is also well-known that the New Paltz public school system at the time stopped instruction at sixth grade. Students would attend private institutions in Poughkeepsie and other surrounding areas. As such, no record exists at local collections on Jane Hayden’s teaching career. We only have the book to faintly hint at what instructional material would be offered at the end of the nineteenth century. Second, Gertrude’s notes and sketches offer a glimpse into the educational prowess and social interests of a ten-year-old New Paltz girl. At the back of the book, Gertrude writes her brief essay in a loose, messy script, and a similarly messy grammar and argumentative style follow suit down the page. One could presume the essay was a rough draft, since text follows up along the side, the page appears on the very back cover, she flips over the book to write a few more notes, and no grade is indicated. Such information could excuse her poor word choice and minimal detail, but what else can you expect for a fifth grader learning about Ancient Greeks and Persians? Through her drawings, one could see that Gertrude admired contemporary fashion and architecture more so than her history studies. Her half-sister’s composition notebook became her artistic playground, where she could illustrate eloquent society ladies with curled locks, and adorned in large hair accessories and elaborates dresses. She also sketched various building designs harking from various eras and cultures, demonstrating that young New Paltz girls were exposed to foreign cultures and societies, either through school or travel. Gertrude even learned about igloos, and designed her own with three rooms: a living room in the back, a dog room in the middle, and a sled room in the front. Her love of fashion continues years later; in the Historic Huguenot collection, a letter between Gertrude and her cousin Sarah describes the New Paltz Normal School burning down in 1906 and her trip to Poughkeepsie with her parents. She draws a rough sketch of a coat on the same page as her still-coarse script. Johnson, Carol A. New Paltz Revisited. Charleston: Arcadia Publishing, 2010. Print. Although her writing and drawing in the composition book presumably does not continue far after the stated date, Gertrude Dubois would later make her appearance in the New Paltz Normal School scene. 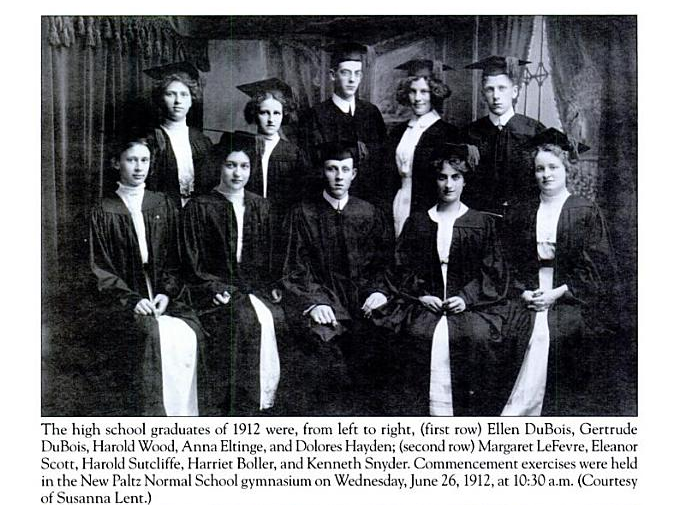 In New Paltz Revisited, a photograph captures her graduating class, including her future husband’s sister, Anna Eltinge. Paltzanga notes her graduation in 1912 from the high school, her marriage to Watson Eltinge, and present status in Ft. Lauderdale, Florida. An Eltinge genealogy records that she died in the same town in August 1981 and that her daughter Bernice survived her. Finally, the names tied to the book establish the complex family histories in New Paltz. Throughout New Paltz academic records and graduation listings, historical surnames such as DuBois, Deyo, Eltinge, and Lefevre appear again and again. Nearly all of these names could be traced back to the Historic Huguenot founders, and even surnames unrelated to the original founders get pulled into these historic families. Although John Hayden (Jane’s father) hails from Illinois, Catherine’s second marriage to Phillip D. Dubois pulls the non-native family into a complex web of relations. This family web already establishes Gertrude in the Eltinge genealogy before her marriage to Watson Eltinge Jr. Familial webs are inconclusive up to Gertrude and hardly mention John Hayden; below is a rough genealogy sketch from Catherine Emily Deyo down to offer to numerous collections of New Paltz history. Current graphical genealogies found online do not touch upon Catherine Deyo and her descendents; this can be the first step to alleviate the issue. Documents of the Assembly of the State of New York, Vol. 8. Albany: 1895. Web. Haviland-Heidgerd Collection. New Paltz: Elting Library. History of the New Paltz Normal School, A. SUNY New Paltz Special Collections. Paltzanga. SUNY New Paltz, 1941. Print. Rachel Eltinge Family Tree. The School Letters of Rachel Eltinge. 02 Jan 2012. Hudson River Valley Heritage. Historic Huguenot Street. 15 March 2013. “United States Census, 1910,” index and images, FamilySearch (https://familysearch.org/pal:/MM9.1.1/M57K-HJK : accessed 15 Mar 2013), Watson Elting, New Paltz Ward 2, Ulster, New York; citing sheet 9A, family 26, NARA microfilm publication T624, FHL microfilm 1375097. “United States Census, 1910,” index and images, FamilySearch (https://familysearch.org/pal:/MM9.1.1/M57K-4CB : accessed 15 Mar 2013), Gertude Dubois in household of Catherine E Dubois, New Paltz Ward 2, Ulster, New York; citing sheet 4B, family 63, NARA microfilm publication T624, FHL microfilm 1375097.